Long legs, cute face with a talking beak and friendly charismatic, personality! 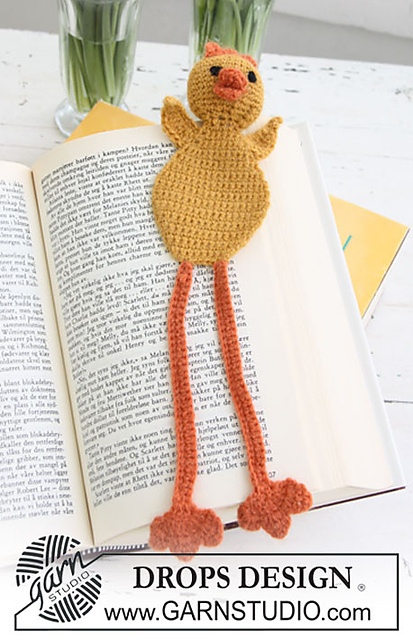 This Chicken Book Mark by DROPS Design is, by far, one off the cutest and funniest bookmarks we’ve ever seen. Using this bookmark will make you feel like you’re having a supporting friend with you while reading your favorite book. This little guy will make you smile every time you see it! A remnant black for eyes. Poly stuffing for filling the head. DROPS CROCHET HOOK size 2.5 mm/US C/2 – or size needed to get 28 sc x 38 rows = 10 x 10 cm / 4” x 4”. Thanks to Drops Design for the article inspiration and featured image.